Tepals 6, golden yellow, 1–1½” long [25–38 mm], spreading to reflexed either in an arc or from the base; 6 stamens; flowers ± nodding, single or sometimes 2–6 on a 6–12″ [15–30 cm] stalk; capsule erect, 1″ tall [25 mm], 3-celled and -sided; 2 leaves 4–8″ long [10–20 cm], basal, wavy-edged; from a scallionlike bulb. 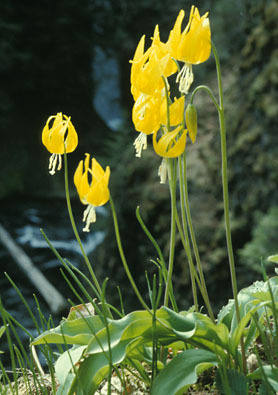 Habitat: Subalpine meadows; also in low-elevation spots with some sun, in the Columbia Gorge. 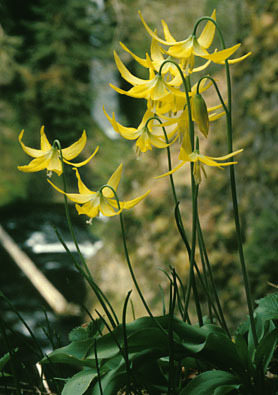 Natural History: Glacier lilies can generate enough heat to melt their way up and bloom through the last few inches of snow (next photo). Fluttering with illusory fragility in subalpine breezes, they offer themselves as vehicles for those anthropomorphic virtues we love to foist on mountain wildflowers—innocence, bravery, simplicity, perseverance, patient suffering, etc. They toil not, neither do they spin. They survive fires well. They don’t taste half bad either. 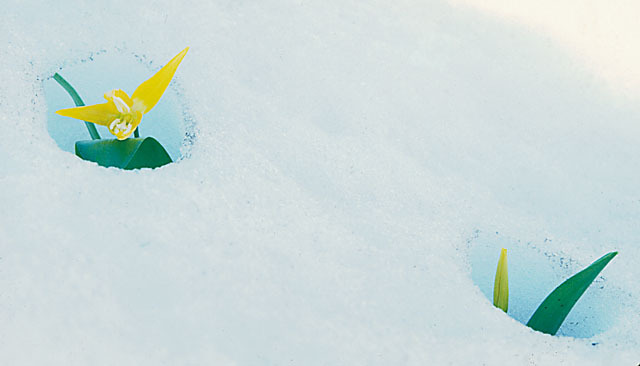 Bulbs, leaves, and flowers are edible, but not a good idea except when starvation threatens. The seed pods are food for hoofed browsers, and the bulbs are “gardened” by grizzly bears, especially in Montana. The bears overturn great patches of sod and then nip off bulbs from the sod underside. (Meadow voles and insect larvae exposed in the process quickly become hors d’oeuvres.) For reasons not clear to scientists nor, presumably, to bears, this has a side effect of increasing soil nitrogen and thus the size, number, and nutritional value of future lily crops. The word “gardening” fits, as year after year the bears come back for the big, rich, bulbs in the loose soil. Montana meadows thick with glacier lilies are likely to have been grizzly bear gardens at some point. 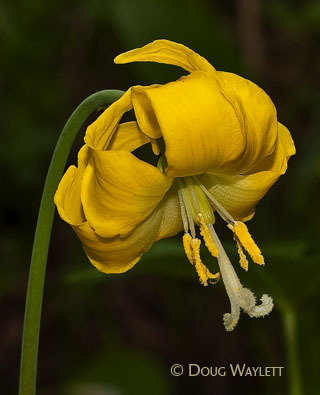 Glacier lily flowers are often seen with the tepals curled up, but at other times they spread almost flat. The first photo below shows a plant in the late morning. The high walls of Eagle Creek Gorge have kept it shaded so far. A couple of hours later, in the second photo, the same plant has curled its tepals to conserve moisture in the bright sunlight.